Nestled in a quiet part of the Makati Central Business District is Swagat Indian Cuisine, a small, nondescript restaurant that promises authentic vegetarian and non-vegetarian Indian fare. This plain looking restaurant along Rada in Legaspi Village isn’t much to look at, but one bite of their food will tell you why Swagat is well-loved and is excitedly spread by word of mouth. First to arrive was my cup of Sweet Lassi (PhP40). 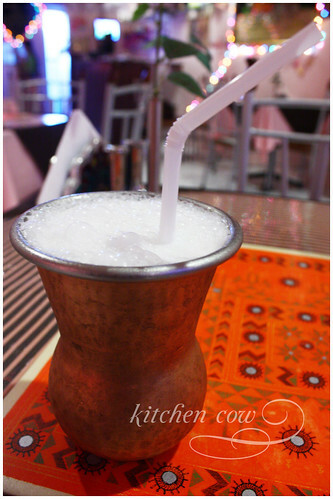 A traditional Indian yogurt drink, their lassi was served in a very cold, heavy, metal cup. The cup looks hand-beaten into shape and is a very interesting way to serve the cold, sweet and tangy drink. The lassi has a nice frothy top; something I don’t usually find in yogurt drinks. 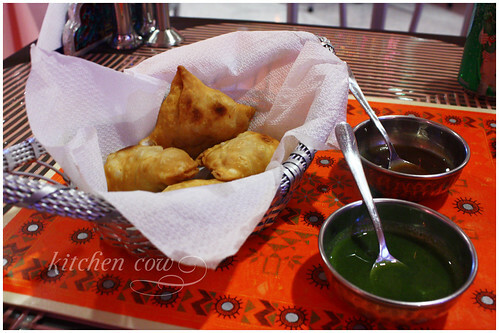 One dish that quickly became a personal favorite of mine is their Vegetarian Samosa (PhP60). Basically, a fried dumpling, their samosa is filled with mashed potatoes, peas, and all sorts of lovely spices that taste awesome as is, and even better with the accompanying sauces. One is a dark sauce that has a salty tang while the other, the one I really like, is a bright green sauce that tastes strongly of cilantro. 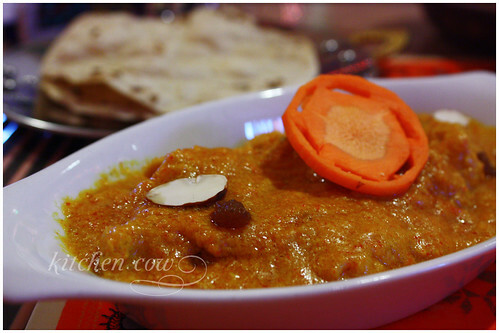 The Murgh Korma (PhP190) is a sloppy-looking chicken dish that’s bursting with flavor. The chicken is cooked with ginger, garlic, yogurt, tomatoes and butter, creating an exciting combination of contrasting flavors. Get some roti, the classic Indian flatbread, to dip into the korma and I’m a happy camper. 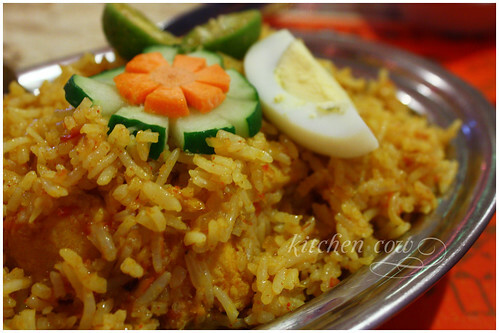 We ordered a rice dish, called Murgh Biryani (PhP160) as well. It’s supposed to be chicken cooked with fragrant biryani rice. It looked appetizing enough when it arrived. Digging into it was a surprise though. What I expected was rice cooked with chunks of chicken. Instead, we unearthed two big pieces of chicken under the rice. It turns out that their Murgh Biryani is a meal unto itself. Yum! For dessert, we tried their homemade ice cream called Kulfi (PhP90). It has a harder consistency than most ice creams. You can actually chew it instead of simply letting it melt. 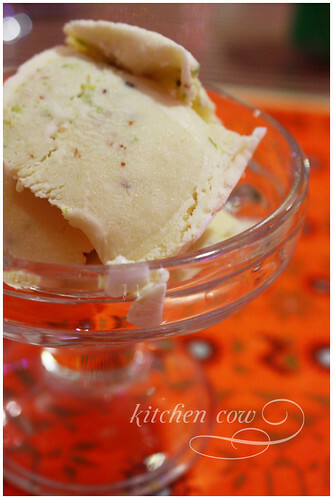 It’s also studded with a variety of chopped nuts, adding interesting textures and flavors to a relatively simple ice cream. Everything we ordered that evening was delicious. The service was good as well, with the staff even asking you how spicy you want your food to be as you order. Combine delicious food with value for money, Swagat is an excellent place to eat, whether you’re a fan of Indian cuisine or simply curious. Word of advice though, if you’re the latter, you’re bound to turned into a fan afterwards. This entry was posted in restos & eateries and tagged biryani rice, chicken dish, homemade ice cream, indian cuisine, indian flatbread, indian food, korma, lassi, makati, roti, swagat, swagat indian cuisine, vegetarian samosa. Bookmark the permalink. Ooooohhh, thank you for reminding me about Swagat. Haven’t eaten there in awhile but we love, love, love their mutton biryani. Mayaya nga si Haligi these Valentine’s day for literally, a HOT date. Hehehe! Always love viewing your posts and photos. That all looks delicious. I really wish there were some recipes to accompany the dishes as it all looks fantastic. I remember walking aimlessly around that part of Legaspi Village alone because I was so desperate to find it — and I was totally convinced that it wasn’t along Rada! I love Swagat. I don’t think I’ve tried their korma; maybe I will next time. Are they open on weekends? Darn, it’s a walk away from our office! But I’m too tamad to walk. Hahaha. And we shall! Soon, I hope! Another must try place. It’s really delicious. Hahaha, not just hot but extra hot I hope! Thanks for visiting maver! They’re open on Saturdays, that I’m sure. It was a Saturday when I ate there. Drag H along one weekend. It’ll be healthy for you and Timmy, with all the veggies and all. I had the same stuff, but in another indian resto (the one in Columns, Ayala). Is it better than New Bombay Restaurant? do they have flavoured lassi? most of the time, i think of lassi as a bigger version of yakult. hehe! Yeah, but I only tried the plain sweet Lassi. If you like Lassi though, you should try the ones they sell at Legaspi Sunday Market. Sooo good! I’ve been meaning to write about it but I haven’t gotten down to sorting my Legaspi photos. Slowpoke is me! hey, thanks for the tip. :o) one of these days, i will drag myself to all those weekend markets. only if i wake up early enough. hehe! last thursday, after reading your post (for the nth time), i wanted to eat indian food. too bad the closest i could get to south asian cuisine is from persian grill somewhere along valero st. (in one of the valero extension roads). didn’t like the chicken biryani i had. it was too bland for me. even the lassi was bland. i expected more flavour. oh well. there’s actually a much closer indian food to where i work, but i can’t eat there, since i would smell of indian food. and i had a meeting after, so i can’t risk it. but i hear they have one of the best indian dish in makati. i don’t know the name of the restaurant, though. it’s along h.v. dela costa. Oooh, let me know how it goes when you eat there. I’m always on the lookout for good food. And don’t apologize for the long comment. May katuturan naman e no! In violation of DTI and BIR regulations, this restaurant has menu prices that are VAT-exclusive. I did notice that also. I think it’s something you need to bring up with the owners though, since I’m just a customer, too. 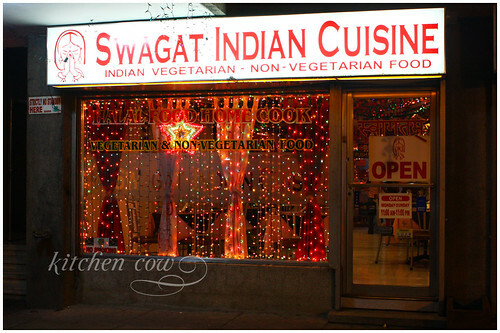 We’ve been to Swagat, their food is good, but I can’t really say it’s authentic. Close maybe, but Garandee and I agree that it is somehow “Filipinized” already. Really? I’ve promised myself I’ll try New Bombay soon. I’m not really a good judge of what’s authentic and all since it was my first time eating Indian food, but it did seem that way, from my viewpoint at least. And even if it’s Filipinized, I don’t really think I mind since I enjoyed eating.